Napoleon Hill was born in 1883 in Wise County, Virginia, a region in the Blue Ridge Mountains where illiteracy and superstition were widespread. He began his writing career at age 13 as a “mountain reporter” for small town newspapers and went on to become one of America’s most beloved motivational authors. His work stands as a monument to individual achievement and is the cornerstone of modern motivation. Hill’s most famous work, Think and Grow Rich, is one of the best-selling books of all time. He established the Napoleon Hill Foundation as a nonprofit educational institution whose mission is to perpetuate his philosophy of leadership, self-motivation and individual achievement. Young Napoleon Hill (named after a rich uncle) was an unruly, aggressive child. When he was 9, his mother died, leaving him with his father, who had difficulty disciplining the boy. His father was later remarried to whom was his guiding light of inspiration – his stepmother. Through the influence of his stepmother, he became a newspaper reporter while still in his teens, supplying local news item to 26 papers throughout the State. The originality of his style brought him to the attention of Robert L. Taylor, former Governor of Tennessee and owner of Bob Taylor’s Magazine, who employed Hill to write “success stories” about famous men. By this means Hill had planned to pay his way through Georgetown University Law School. He has enrolled as a student of 1908 when he received his first assignment from Governor Taylor to interview Andrew Carnegie, one of the richest men in the world. Arrangements were made for a three hour interview, but Carnegie strung it out to three days and nights, during which Hill was entertained at the Carnegie home. During this time Carnegie sold Hill the idea of organizing the world’s first philosophy of personal achievement, based on the seventeen principles of success which he had used in accumulating his vast fortune of over 500 million dollars. 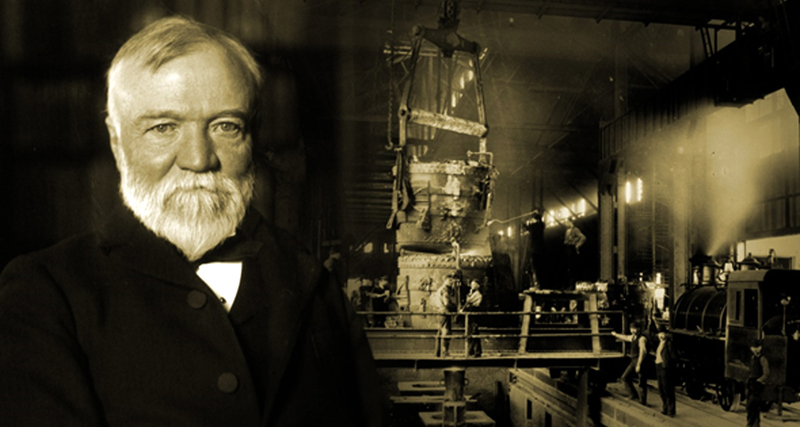 Carnegie provided Hill with no subsidy for the job except to pay his expenses while he was interviewing Henry Ford, Thomas A. Edison, John Wanamaker and some 500 other of their caliber, explaining that he wished to make sure that Hill learned to apply the philosophy he was to organize-thus proving its soundness by his own achievements. Carnegie introduced Hill to one after another distinguished leaders in other fields of business whose cooperation he enlisted in contributing their own experiences to be included in the philosophy. Besides Henry Ford, Thomas A. Edison and John Wannamaker, some of the 500 best-known and most successful men this country has ever known who contributed to this philosophy included Dr. Alexander Graham Bell, Woodrow Wilson, Luther Burbank, William Howard Taft, Cyrus H.K. Curtis, Edward Bok, Dr. Elmer R. Gates, F. W. Woolworth, Edwin C. Barnes, James J. Hill, and many others. In 1921 Napoleon Hill became the first advertising manager of LaSalle Extension University of Chicago and was largely responsible for getting LaSalle operating on a sound financial basis. While at LaSalle he wrote a course in advertising and salesmanship and later taught this course in classes at Bryant and Stratton Business College in Chicago and through their correspondence facilities. He entered the service during World War I and was assigned to President Woodrow Wilson’s staff as public relations expert. In 1919 – 1920 he edited and published the “Golden Rule” magazine. By applying the philosophy he so managed the magazine that it earned a substantial profit the first year – an achievement rarely experienced in the publishing field. 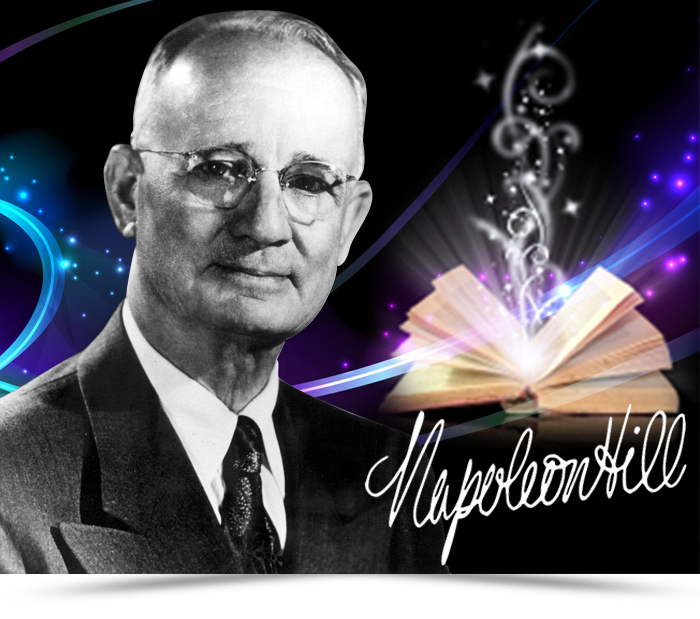 Dr. Napoleon Hill compiled the first interpretation of the philosophy of individual achievement in the Fall of 1923. The eight volume manuscript, “The Law of Success,” was published in 1928, exactly twenty years after the famous Carnegie interview. It had taken as long to compile it as Carnegie has said it would. This work was distributed throughout the nation and Senor Manuel L. Quezon had it adopted for the public schools of the Philippines. In 1993 Dr. Hill again became a presidential advisor and it was him who gave F.D.R. the idea for his famous speech, “We have nothing to fear but fear itself” – which helped to halt the financial hysteria at the pit of depression. While on the Staff of F.D.R. he devoted his spare time to writing and completing six books – among them the prominent “Think and Grow Rich.” Dr. Hill helped to inaugurate F.D.R.’s famous Fireside Chats and wrote much of the contents of same. When Honorable Daniel C. Roper was a member of the President’s Cabinet, during the year 1934, he gave a luncheon in honor of Dr. Hill. When he introduced his guest he astonished his visitor by saying, “Gentlemen, I have the honor of presenting a man who has made what is in my opinion the greatest contribution to the generation in which we live, and one that will insure his name a place among the names of the other great men who have given us the American way of life. The release of the book “Think and Grow Rich” was particularly instrumental in the transforming mindsets in the 1930s, a period that provided much gloom to industrial America. As many wallowed through the great depression, the book was a revelation that success was only limited by the mind and not by circumstance. Dr Napoleon Hill’s researched on over 500 Americans in terms of social, economic, industrial, financial, and scientific leaders in their own right, unveiled 17 principles of success which continues to influence and transform many. It is a legacy that has proven practically and literally evergreen. 1952 Napoleon Hill Foundation was organized by W. Clement Stone, President of Combined Insurance Company of America, who attributes much of his success in the attainment of a 100 million dollar personal fortune to Dr. Napoleon Hill’s philosophy. The fruitful association went on for ten years instead of the originally planned five. During these 10 years the lives of countless thousands of persons of all ages and stations of life, in many parts of the world, were affected for the better through books – hardbound and paperback – newspaper and magazine articles, lectures, home study courses, class instruction, radio and TV appearances, movies, tapes, and last but not least, advisory and financial help. “Whatever the mind of man can conceive and believe, it can achieve,” is the core of Dr. Hill’s philosophy. You can, he says,” be anything you want to be, if only you believe with sufficient conviction – and act in accordance with faith.” The philosophy coincides with all religions, remains politically unbranded, and is understood by people of all classes.